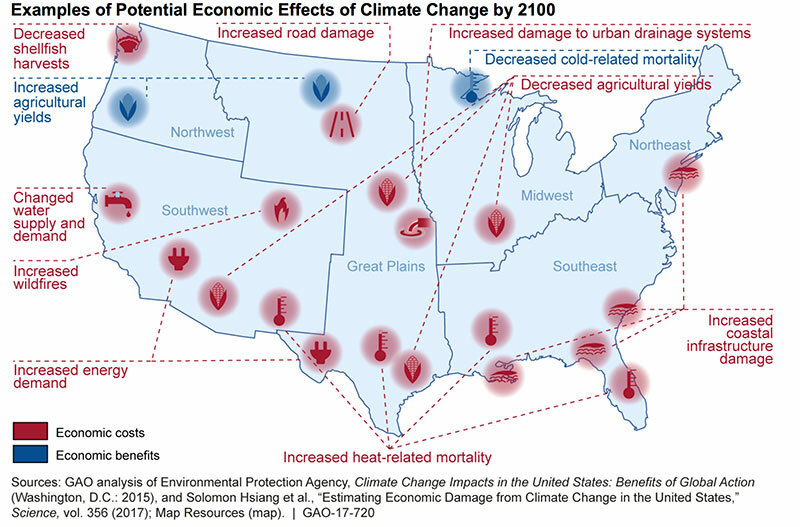 The two available national-scale studies that examine the economic effects of climate change across U.S. sectors suggested that potential economic effects could be significant and unevenly distributed across sectors and regions. For example, for 2020 through 2039, one study estimated between $4 billion and $6 billion in annual coastal property damages from sea level rise and more frequent and intense storms. Back in 2012, Superstorm Sandy offered a heads-up on hurricane risks, killing 43 people and causing US$19 billion of damage in New York City alone as it pulled in a surge of seawater that rose more than 5 feet (1.5 meters) above ground level in many neighborhoods. If Sandy’s remnants hadn’t missed Boston’s high tide by a few hours, a similar storm surge would have swept across low areas of the city. Today, a Massachusetts Institute of Technology (MIT) analysis suggests, a Category 1 hurricane with a few feet of surge on top of a high tide could flood a quarter of a million Boston residents. And climate change is bringing more intense storms and rising tides. Like other coastal metropolises, Boston is working on projects large and small to meet these threats. Most dramatically, the city is considering building a giant seawall across the harbor, somewhat like the huge barriers that now protect New Orleans as well as Rotterdam and a few other European cities. Boston is enjoying good economic times. Construction is booming along the harbor, which was cleaned up by a multi-decade megaproject officially completed in 2016. There is also a working political consensus to take on climate change that extends to the state level, where the governor last year signed an executive order to plan for climate change mitigation and adaptation. But launching a multi-billion-dollar, multi-decade megaproject like a giant seawall, in a country that often fails to maintain its existing infrastructure, is no simple task. To get things started, experts say, the city and its partners must plan long and hard, with all the project options and alternative approaches on the table, and keep local residents and other stakeholders involved from the start. When European settlers arrived, Boston was all but an island. More than half of the modern downtown is built on tidal land, and some parts routinely flood even in calm weather. Like the rest of the northeastern coast, the area has been subsiding very slowly into the sea, about 9 inches (23 centimeters) during the 20th century. Now the city expects much quicker sea level rise, with 3 additional feet (0.9 meters) commonly expected by 2070 — and perhaps more than 10 feet (3 meters) by 2100. Rising tides are arriving along with rising risks of big storms. Boston hasn’t been hit head-on by a hurricane for decades. But as waters warm, Atlantic hurricanes appear to be growing more frequent, bigger, stronger and wetter, and they also seem to be maintaining their strength farther north along the U.S. coast, according to Kerry Emanuel, professor of atmospheric science at MIT. The city presented its current framework for protecting its shores in its Climate Ready Boston plan in December 2016. The plan presents many options to protect against storm surge, sea level rise and intense rainfall like that which swamped Houston during Hurricane Harvey. A few new buildings take on storm surges as a personal challenge. The poster child for this response is the Spaulding Rehabilitation Hospital, which opened in 2013 with generators on the roof, barriers and berms to hold off floods, and even a roof over the entrance that can act as a dock if water gets that high. But a surge could simply flood most of Boston’s buildings and key infrastructure on or near the waterfront. So various proposals for seawalls have been floated for decades. Currently, researchers at the University of Massachusetts Boston are putting together a feasibility study of two alternative barriers. One would stretch 4 miles (6 kilometers) between Winthrop and Hull, two nearby towns that bracket the entrance to the outer harbor. The other — much shorter — one would cross the entrance to the inner harbor from Logan Airport to South Boston. In 2008, Cedar Rapids, Iowa, was devastated by its worst flood ever. The Cedar River rose eleven feet higher than it ever had before. Robert Davis is the city’s flood control program manager. He says people were cut off from services, and emergency vehicles struggled to get where they needed to go. Davis says this flood was an extreme case. But as the climate changes, big floods on the river are growing more common. Last year, the river overflowed again, topping the pre-2008 record by two feet. So the city’s making changes. It’s building a levee and flood wall system around the sewage treatment plant. It also plans to elevate bridges using the 2008 river levels as a guide. The hope is that it will keep the bridges well above whatever flooding the next century brings. Economics! We Republicans spit on economics!! Unless we can profit from exploiting some catchphrase from it. I think the number should be $350 billion a year by 2050. We are already at about $35 billion a year today. From Robert Scribbler, as the figures at this time are just partial and no economic cost to business has been factored in. As a measure of money alone and leaving aside the untold human misery, hurricane Harvey may ultimately cost the U.S. $180 billion, Irma may cost the U.S. $65 billion, and Maria may ultimately cost the U.S. as much as $100 billion. Adding in the $85 billion dollar damage estimate for the devastating California wildfires which were also made worse by climate change, and the total cost to U.S. society from these four disasters alone may top $430 billion. Now add in the other droughts and intense floods and looks like some more wild and wet weather on the way. Sure the Vulture/disaster capitalists will have a field day for a while rebuilding , until the money runs out. Already in some coastal areas 30 year mortgages are becoming like hens teeth and insurance is approaching unaffordable as the GOP is trying to cut funding for firefighting and disaster response. We will adjust and handle climate change they say, sure, HOW? and who will pay for that. Many laughed at China building these massive ghost cities inland, all ready to go with all infrastructure and fitted out eateries and shops.